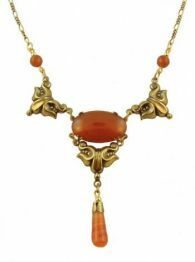 Antique & Vintage Style Costume Necklace and Pendant. 38 Items. Showing Items 1 thru 15. 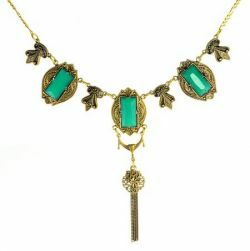 Layers of vintage style book chain cascade around an exquisite pendant cut from the bowls of antique serving spoons. 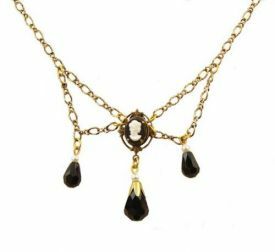 The silhouette of this necklace was inspired by antique Victorian fashion of the late 1800s. 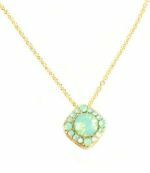 Swarovski pacific opal colored rhinestone halo pendant suspended on a yellow gold plated cable link chain and solitaire stud earrings. 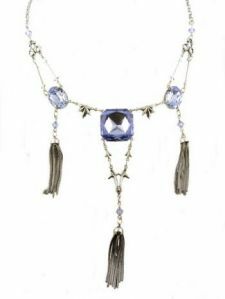 An awesome Art Deco tassel necklace with large blue foil backed crystals. A real show piece! The metal used is silver plated brass with an antiqued (oxidized) finish. 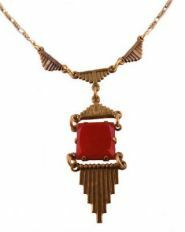 Carnelian colored vintage Czech glass set in an Art Deco style setting suspended by Art Deco patterned links with a pyramid shape. The metal used is brass with an antiqued (oxidized) finish. 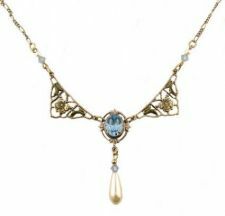 Victorian style floral filigree with large blue foil backed crystal, Swarovski Austrian crystals & faux pearl drop swag necklace. The metal used is silver plated brass with an antiqued (oxidized) finish. A festive and sparkling multi pastel colored rhinestone encrusted crystal ball suspended on a 14k yellow gold filled vintage style textured oval link chain. 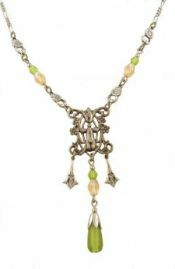 Peridot & pink colored crystal link alternating with floral links accent the vintage Art Nouveau designed filigree center piece. 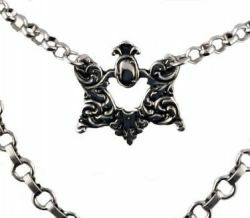 The metal used is silver plated brass with an antiqued (oxidized) finish. 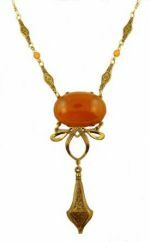 A vintage sardonyx colored pressed glass intaglio is the center piece that brings together filigree links with genuine sardonyx accent beads. 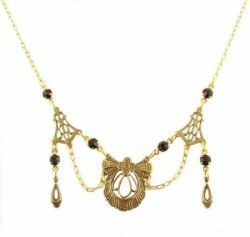 A delicate filigree dangle completes the lavaliere. The metal used is brass with an antiqued (oxidized) finish. 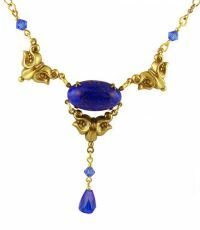 Vintage Czech lapis lazuli glass cabochon & filigree festoon necklace. 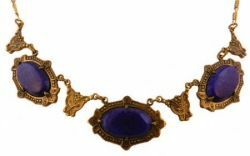 Vintage parts are used on the glass stone, setting and filigree station links. The metal used is brass with an antiqued (oxidized) finish. 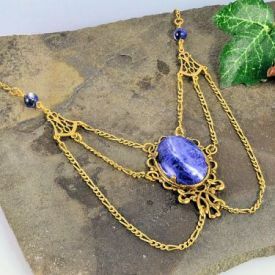 Genuine sodalite & filigree festoon necklace. 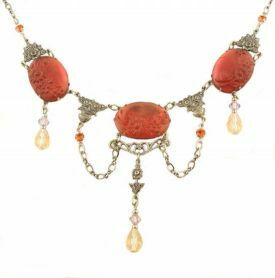 Vintage parts are used on the stone setting and filigree station links. The metal used is brass with an antiqued (oxidized) finish. 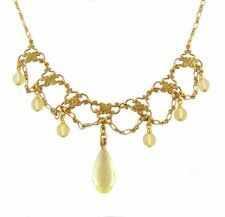 Victorian style filigree & jet crystal festoon necklace. Jet black crystals accent the vintage filigree sections. The metal used is brass with an antiqued (oxidized) finish. 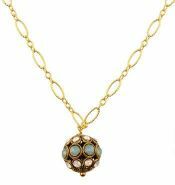 A festive and sparkling opalescent colored rhinestone encrusted crystal ball suspended on a 14k yellow gold filled vintage style textured oval link chain. 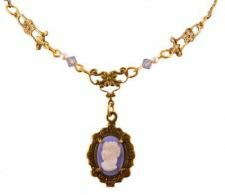 Vintage glass cameo that is Wedgwood blue in color set in a floral frame setting. 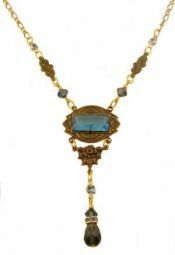 Accenting the necklace are faux pearls and crystals with a floral center piece. The metal used is brass with an antiqued (oxidized) finish. 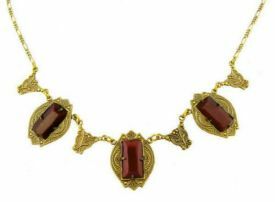 Sardonyx colored Czech glass with repousse links that are reminiscent of Victorian hollow ware jewelry. The metal used brass with an antiqued (oxidized) finish. 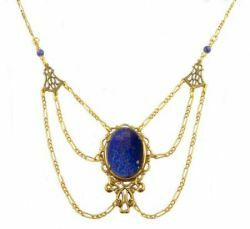 Lapis colored Czech glass center piece with gold flecs and repousse links that are reminiscent of Victorian holloware jewelry. The metal used is brass with an antiqued (oxidized) finish.